5000 lb. 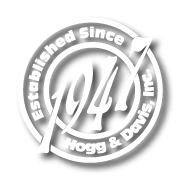 Payload, 72″ x 50″ REELS Hydraulic Loading, Single reel capacity, single axle, tubular steel construction. 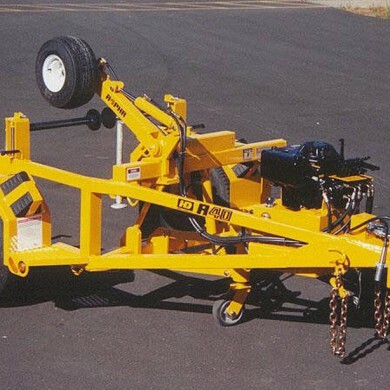 Hydraulic Loading, Multiple pocket mandrel lifting racks can load reels up to 72″ diameter and 50″ wide. System is designed to carry reel with uniform ground clearance and to carry reel at lowest possible center of gravity for better towing. Racks are stabilized and locked mechanically to transfer load from the hydraulics to the mainframe. Reel Mandrel: Mild steel, 2″ diameter solid bar w/ two (2) tapered centering cones and two (2) locking collars. Hydraulic Pump: Manual, 3-stage pump with reservoir located curbside front. Dual 3/4″ pistons operate the lifting cylinders. 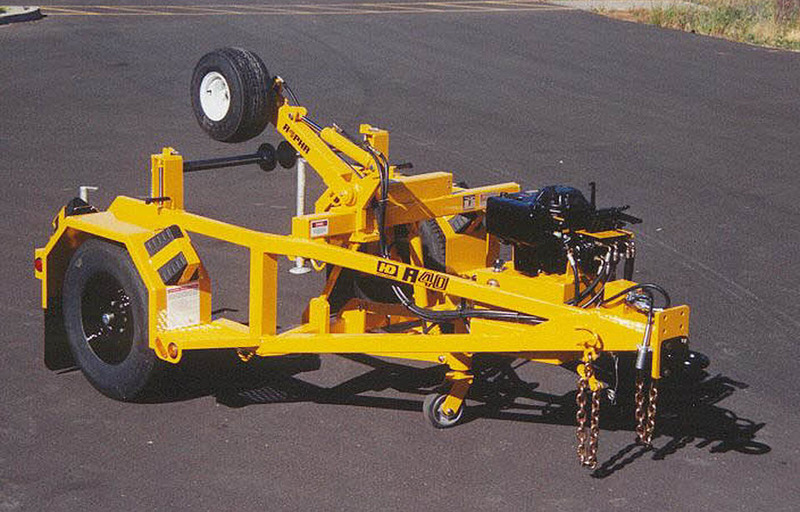 A single, 1-inch piston provides lift for the hydraulic idler wheel. Idler Wheel: Double “A frame” mounted to trailer mainframe. Full spindle, tapered roller bearing mounted with 360-degree swivel, 8″ diameter wheel. Hydraulically lowered, spring retracted. 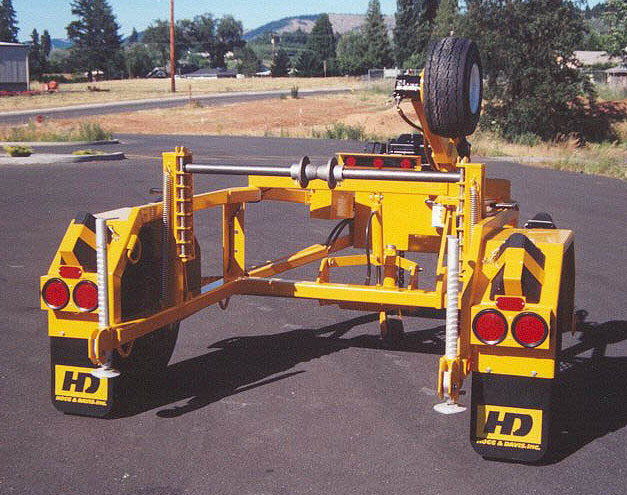 Safety Stands: Two (2) self-adjusting, quick release, mounted at each rear corner of trailer. Spring ratchet locking. Increase the versatility of your R 40 by adding the optional retriever. This unit will provide approximately 1500-2000 lbs. line pull. The retriever utilizes the hydraulic tool circuit of your truck to provide pressure against the reel and rotation of the retriever wheel. This is a bolt-on option that can be easily added to the unit by your personnel. Dump Box Option: Handy dump box fits into reel carrying racks to haul material to the job or trash away from the job. Box capacity is 1.2 cu. yd. A mechanical lock holds box in position for travel and a simple chain hoist can be used for dumping. Dimensions: Length: 162″, Width: 88″, Weight: (unladen) approx. 1200 lbs., Tongue Weight: Approx. 250 lbs. Axle: 6,000 lb. Stub spindle w/heavy duty bearings. Cast hub and drum assemblies. Brakes: Electric (12v), 12″ x 2″ w/breakaway switch and drycell battery. Fenders: Full tire coverage, 11ga. steel w/ mud flaps. 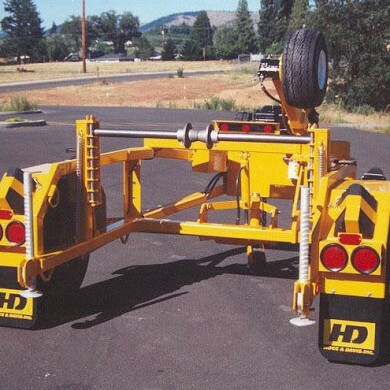 Towing Attachment: 3 inch ID adjustable Pintle eye with (2) 3/8″ x 36″ safety chains and grab hooks. Electrical: All wiring enclosed in frame, conduit or loom. Heat shrink terminal connections and terminal blocks. All lighting and reflectors as per FMVSS 108. Electrical connection cord, 7-wire x 36 inches. Wheel Chocks: Four (4) w/ holders.